How long does it take after immersion into cold water to develop hypothermia? I am interested in different water temperatures and without or with some kind of heat loss protection (relevant for diving/sailing? ), just state for what conditions your information hold. It is generally considered that the first stage of hypothermia begins below 35degC core temperature. Please reference studies, first hand experience or give any other sort of explanation, why your source is viable. I found many articles via google that claimed different things, mostly not well based (at least not declared). And a couple of snippets, the first showing how water cools faster than air. In this test with 10degC water, subject's core temperature was still over 36degC after approx 40 minutes. ...and the second showing effect of different clothing. 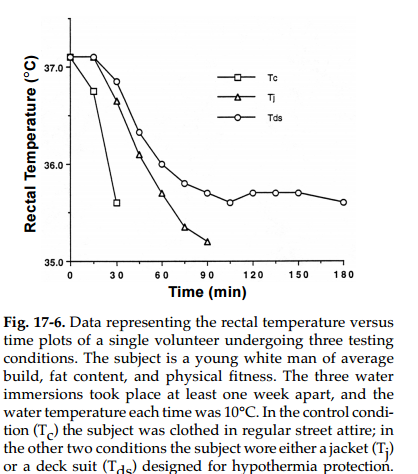 In this test with 10degC water, subject (wearing 'street' clothes) had core temperature of 35.6degC after 30 minutes. We are taught in New England that if you fall in the water in winter, you have to get yourself out as fast as you can. Any longer than 10 minutes in the water and you will no longer have the strength nor ability to hoist yourself out of the water, and may begin to loose awareness of the fact that your in trouble at all. After 45 minutes floating in winter seawater and the chances of survival are near to zero. Of course there is always the freak incident of someone's body shutting down allowing survival past all comprehension, but that's a very rare exception to the general rule. Not the answer you're looking for? Browse other questions tagged health hypothermia cold-water or ask your own question.